My family recently visited Shenandoah National Park and the surrounding areas. Such a beautiful location. It was a short trip focused on enjoying the park with no time set aside for genealogy research. But I couldn't help but look at the beautiful view and think of my Virginia ancestors. I have deep Virginia roots. My links to the Shenandoah area of the state include Augusta, Orange, Rockingham and Shenandoah counties and cross both my maternal and paternal lines. As mentioned, I had no time to conduct genealogy research on this trip, but as a typical genealogist will, I did a little prep on the off chance that some research could be fit in. And it was clear right away that my genealogy research is not cross referenced by location and it would take quite a bit of work to iron it all out. One of the keys to extensive family history research are the records kept at the county level, and yet my filing system is not prepared to support those spur of the moment trips. What is a researcher to do? Create a tool, of course! Now, when I'm out and about all I have to do is search for Shenandoah on my blog and I'll have quick access to each of the lines in that particular area. My hope is to continue this process in other locations, ultimately creating time-saving tools. Randy Weaver asks: Am I related to Donald Trump? 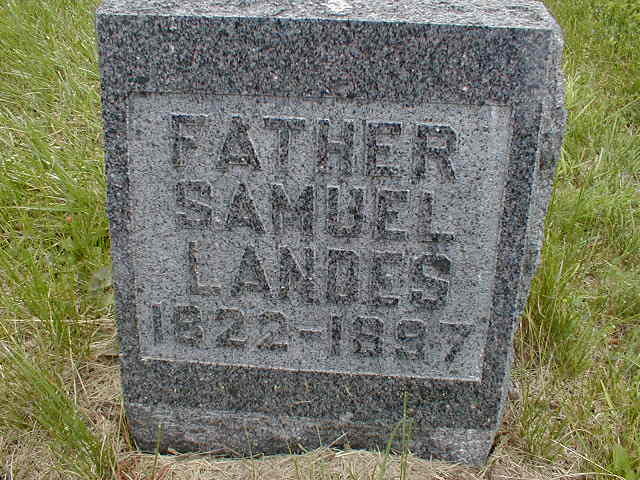 Samuel Landes is a third great grandfather through my paternal line. Samuel was born in 1822 to Samuel Landes (1788-1849) and Elizabeth Sheets in Staunton, Augusta County, Virginia. As with some of my other lines, spelling has become an issue with the Landes name. I have seen it as Landes, Landis, Landess and Landiss. I've also realized that I do not have a lot of information on this line. I love that this writing prompt is helping to highlight research gaps! Samuel was the fourth of 8 known children with Elizabeth Sheets. Samuel Sr. and his life are a little difficult to track. Samuel Sr. died in December 1849 as indicated on the 1850 census mortality schedule. I can find no trace of Elizabeth's death, however, I found an online history that states Elizabeth Sheets Landes died in 1828 following the birth of twins, more than likely from complications from the birth. I have no official record of this, but Samuel does appear to remarry an Elizabeth Welch and has additional children. The Landes family were farmers in Augusta County. I have not found a record of the senior Samuel Landes' will, but in the 1850 census, his second wife is living on the farm with her children. The older children appeared to have moved on. 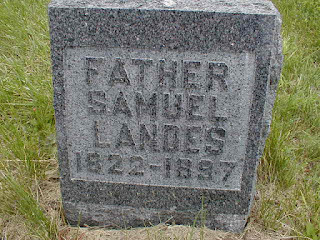 Samuel Landes, Jr., married Eliza Jane Royer sometime prior to 1848. Sadly, Eliza died in 1850 from pneumonia. Samuel then remarried Elizabeth Beard. I have not been able to find a marriage record, but it was sometime prior to 1853 when their first child together was born. So you read all of that correctly. Samuel married Elizabeth and then Elizabeth. Then his son, Samuel, marries Eliza and then Elizabeth. Needless to say, it's easy to get the group confused! Samuel Jr. could have been the right age to have served in the Civil War. There are records of a Samuel Landes enlisting in 1862, but I cannot confirm that it is the correct Samuel. However, Samuel came from Mennonite roots and more than likely would not have fought in the war. Samuel Jr. is listed as both a miller and a farmer in Augusta County, Virginia. At some point between 1870 and 1880, the family moves to Johnson County, Missouri. It is unclear why the family leaves Virginia, but he continues farming in Missouri. Samuel dies in Kingsville, Johnson County, Missouri in 1897 and his wife, Elizabeth, dies just three years later. They are both buried in the Kingville Cemetery. This post is part of my on-going goal of 2013 to research each of my 32 3rd great-grandparents more in-depth. Samuel is #11 on my list. Help solve a photo mystery at Where Were They Then? Charles O. Johnston is a third-great grandparent through my paternal line. Charles was the last child of seven known boys born to Exum and Alice (Unknown) Johnston. His parents were both from Virginia, though I have been unable to confirm from where. Several online genealogies list the couple from Isle of Wight County, but I haven't be able to find any proof. Since revisiting this family, I have also found information stating the Exum was married at least three times. Therefore, I do not have proof the the children below are with his relationship with Alice or with another spouse. However, these are children that I feel relatively certain belong to Exum. The family were farmers and according to the 1850 census, Exum owned 2500 acres, a large farm in my mind. Charles is listed on censuses as a shoemaker. That is a first that I have found in my research. Though he would have been approximately the right age to have served in the Civil War, I have found no reference to military service. 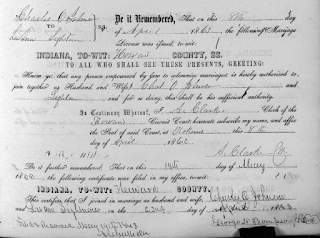 Charles married Louann Lightner in Howard County, Indiana on April 22, 1863. The couple's youngest son, Adrian Lightner Johnson, was an avid genealogist and tracked the Lightner family line back to the Mayflower. However, I have been able to find little to no research from Adrian on the Johnston line. This is an interesting line in that I can't find much proof of anything. One issue could be the age old problem of spelling: Johnston versus Johnson. That "T" can make a big difference! 3. Research more on extended Johnston family. This post is part of my on-going goal of 2013 to research each of my 32 3rd great-grandparents more in-depth. Charles is #15 on my list.